Four local powerhouses on the secrets to their success, the obstacles they overcame and the risks that paid off. The community of 417-land’s professional women is nothing short of inspiring. 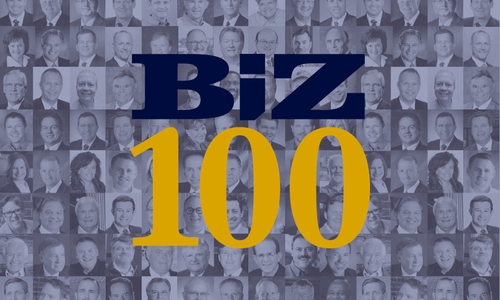 So inspiring that we received more than 50 nominations for this year’s class of Women Who Mean Business. 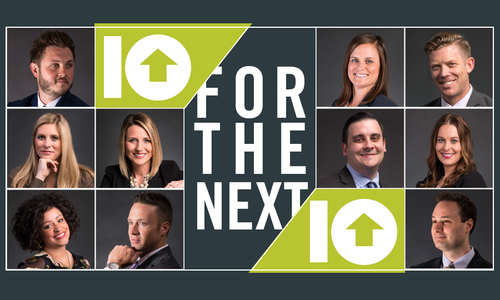 We sifted through dozens of impressive applications and selected four women who exemplify professional excellence, community involvement and compassionate leadership. Our selection criteria are tough, but these women check every box. 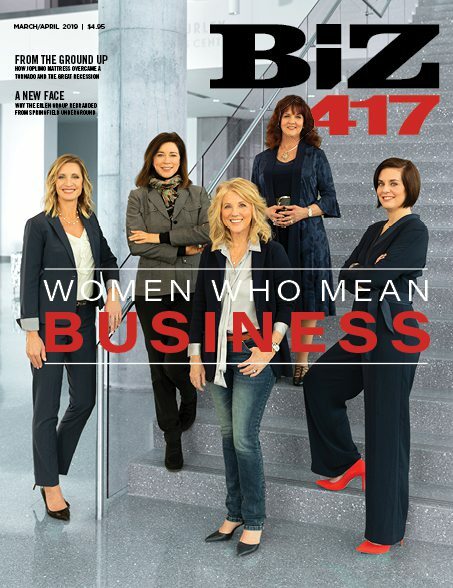 Find out how they worked their ways to the top in male-dominated fields, created distinguished careers and are impacting 417-land’s business realm in major ways. As CoxHealth’s first in-house legal counsel, Charity Elmer has built the health system’s legal presence from the ground up. Now, Elmer leads a stellar woman-dominated team with equal parts candor and compassion. Charity Elmer will be the first to admit that she is not a numbers person. “That’s why I went to law school,” she jokes. “Because I’m not good with blood or numbers.” That humility is part of what makes Elmer’s leadership style so refreshing. 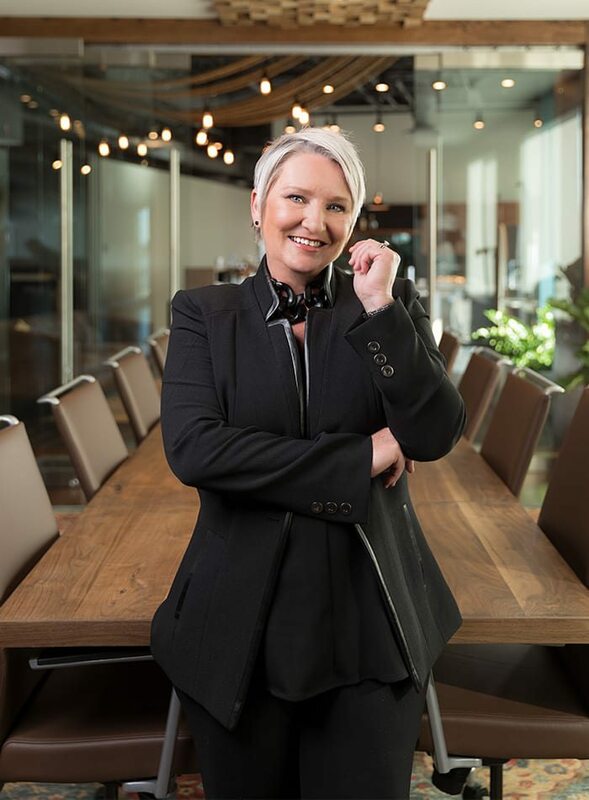 Her candor is reflected in the way she deals with her all-star legal team; it’s also apparent in her approach to mentoring young women in and out of the office. Elmer is passionate about owning her weaknesses and prioritizing transparency—an approach she cultivated after years of fighting her way to the top in a highly competitive legal setting. While Elmer was at Blackwell Sanders, she had the opportunity to work on a malpractice case involving a CoxHealth physician, who mentioned the health system was hiring its first-ever in-house legal counsel and encouraged Elmer to apply. She couldn’t resist. “There aren’t many in-house positions in Springfield,” Elmer says. “But an in-house position at CoxHealth was the most desirable place I could have ever imagined working.” After her first interview, she was so certain she wouldn’t get the job that she ended up shredding the information she was given so no one would know she applied. About a month after her first interview, however, she was asked back for a second interview—and got the job. “Getting a position like this for a billion-dollar health firm at the age of 31—as a female, no less—is exceedingly rare,” Elmer says, who considers the feat her biggest accomplishment to date. Born in Springfield and raised in Ash Grove. Married with two teenage sons. Drury University, bachelor of criminology and sociology; University of Arkansas, J.D. Becoming CoxHealth’s first in-house legal counsel at 31. Fitness, cooking, baking and listening to audiobooks. Elmer is making her way through several fitness and nutrition-related audiobooks. She also loves true crime, having recently read In Cold Blood by Truman Capote and Indefensible by Michael Griesbach. Outside of the traditional legal issues, Elmer’s team deals with a plethora of emotionally tough patient care situations. “Not a day goes by when we’re not helping someone make a life-changing decision,” Elmer says. The key to managing top-notch employees when the going gets tough? According to Elmer, it’s essential to make your team feel valued and accepted, even when you might not understand their perspective. “Make people feel safe when expressing their opinion,” Elmer says. “Don’t belittle them or make them feel stupid, even if [their opinion] doesn’t make sense to you.” Elmer has an inherently transparent communication style, working to tie radical honesty into her daily dealings at the office and with the multiple young women she mentors through community programs. “The best advice I can give is to own your strengths and weaknesses,” she says. “I’ll tell you all day long the things I think I could do better.” Furthermore, she’s committed to learning from her mistakes and bettering herself in challenging situations. Whether it’s crunching numbers or riding out a challenging legal situation, one thing is certain: Elmer’s compassionate nature has taken her straight to the top. Joins Blackwell Sanders as an associate attorney. Encouraged to apply for CoxHealth’s first in-house counsel position while working on a medical malpractice case at Blackwell Sanders. Hired as CoxHealth’s first in-house counsel. Represents CoxHealth as the only in-house legal representative during a federal investigation into some of the health system’s financial transactions. Becomes CoxHealth’s senior vice president and general counsel. Kerri Miller’s path to her passion was unorthodox to say the least. Now, the CEO and founder of Make People Better LLC works tirelessly to help patients bridge the gap between illness and recovery. It all started with a trip that changed her life forever. After giving birth to her first daughter at age 18, Kerri Miller was more concerned about seeking stability than pursuing a passion. Hoping to provide for herself and her newborn, Miller enrolled in nursing school and began working in the Cox South Neuro Trauma Intensive Care Unit. However, after several years of emotionally challenging ICU work, Miller wanted more. After receiving her bachelor’s degree in nursing at Drury University, she continued her education in pursuit of a nurse practitioner position—a decision that led to her commuting more than five hours a day twice a week to pursue her master’s degree at the University of Missouri–Kansas City while also raising her three children in Springfield. 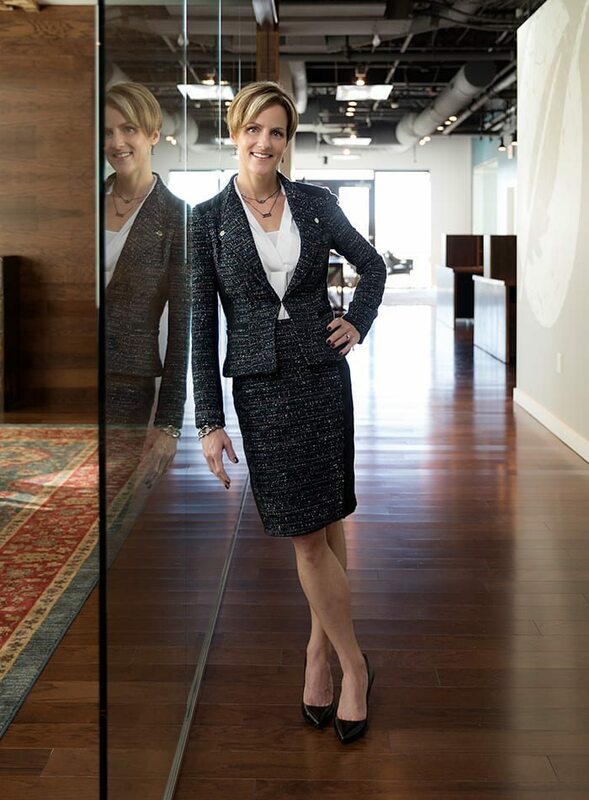 That grit and determination is characteristic of the rest of Miller’s career as she went from a search for stability to what she considers her true vocation: working full-time to bridge the gap between illness and recovery through her company, Make People Better LLC, and their flagship product, re:immune. The trip ignited a passion for global health that has led Miller to return to Nicaragua again and again for a running total of 16 trips. That passion also inspired Miller to pursue her doctorate in nursing at the world’s top global health facility: Johns Hopkins Bloomberg School of Public Health. The doctorate program required eight elective hours, which Miller chose to complete through the Global Health Effectiveness program at Harvard University. Never one to back down from a challenge, Miller moved to Boston for eight weeks and found herself living in a Harvard dormitory amongst a variety of physicians, all of them younger than her. Miller’s doctorate program also required that she implement a project to enact change in the global health arena. Around that time, Miller received a call that a baby in a Nicaraguan community she had served had died from diarrheal disease. Miller had found her global health project. She would go on to implement a World Health Organization protocol that addressed diarrheal disease in Nicaraguan children through oral rehydration therapy and a community health education process. Married with three adult children. Drury University, bachelor of nursing; University of Missouri–Kansas City, master of nursing; Johns Hopkins Bloomberg School of Public Health, doctor of nursing. Spending time with family and friends as well as traveling. Meaningful Work by Shawn Askinosie. Miller has cultivated a daily mindfulness practice that helps her focus on gratitude. Miller’s path to finding her passion was unorthodox, but she’s thankful for the journey. Her first piece of advice for other professional women struggling to find their calling? Work hard—and be patient. “I was 43 when I found my passion,” she says. “Take the pressure off of yourself and just know that you’re on the right trajectory.” She also emphasizes that it’s important to be practical when building a lasting career. “Sometimes you have to pay the bills,” she says. “That’s reality. It’s okay to do what you need to do before you can do what you want to do.” A strong believer in the power of mindfulness, Miller has a quote on her vision board that reads “Now is right on time.” She’s living proof that every step in a professional journey, no matter how surprising or challenging, has the potential for a positive impact. Receives her bachelor’s degree in nursing from Drury University. Earns her master’s degree from the University of Missouri–Kansas City and becomes a licensed nurse practitioner. Takes her first medical service trip to Nicaragua with local nonprofit organization Project H.O.P.E. Receives a certificate in global health from Harvard University. Completes her doctorate degree from the Bloomberg School of Public Health at Johns Hopkins University. Starts Make People Better LLC with the goal of bridging the gap between initial patient care and sustained healing. The Make People Better team launches re:immune, an illness recovery supplement. 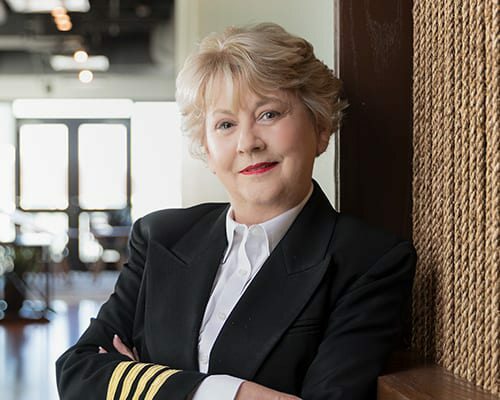 Mary Kellogg-Joslyn went from a high-powered position in Hollywood to perfecting the customer experience at Branson’s Titanic Museum Attraction. Her transition from television to Titanic has been marked by hard work, employee empowerment and, most importantly, a passion for touching lives. When Mary Kellogg moved to Los Angeles at the age of 21, she didn’t have a job. She did, however, have a dream: to climb the retail ladder and eventually serve as president of a major department store. After arriving in California, she searched for job openings in the newspaper until she landed a spot in the advertising department of Bullock’s, a Los Angeles-based department store. While working there, she became acquainted with a newspaper salesman from the Los Angeles Times who passed along an opportunity in the sales department at a local CBS station. Kellogg decided that entering the television arena was a valuable next step in her retail career. “I needed to understand the television rating system to get the department stores on television,” she says. 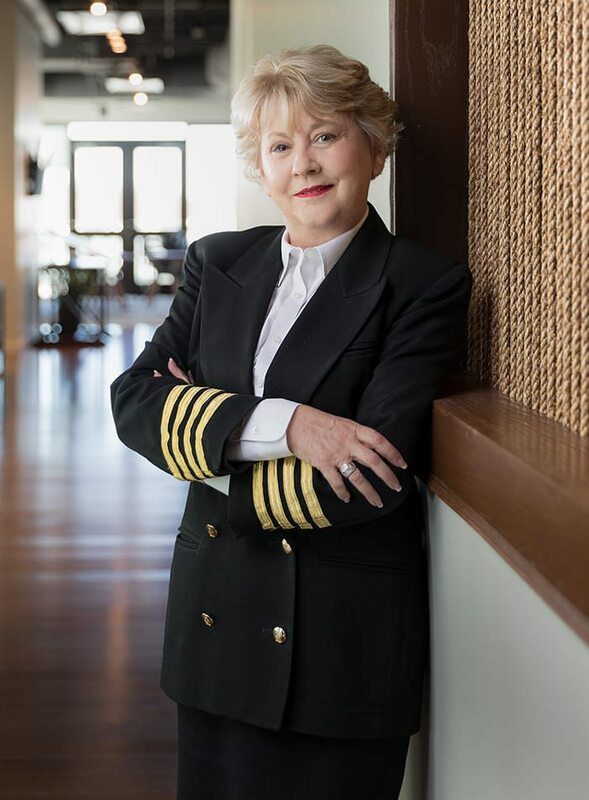 That was the first step in a successful television career—a career that would take an unexpected turn when, years later, she moved to Branson to open the Titanic Museum Attraction. For Kellogg, the road to her dream career was full of unexpected twists and turns that required a little flexibility and a lot of guts. Now, she encourages ambitious young women to be bold when pursuing their dreams. Take, for example, her approach to landing a high-level marketing job at the CBS station. When the job became available, Kellogg executed an advertising campaign for herself to set her application apart. Every day, she placed a box of Kellogg’s cereal on the hiring manager’s desk. On the back of the box was an ad she designed to encourage him to “hire Kellogg.” She then convinced her contact at the Los Angeles Times to run a one-page ad—again, encouraging the hiring manager to “hire Kellogg.” When the hiring manager stumbled into her office, stunned, Kellogg smiled and shrugged. “I can tell you I’m creative, or I can show you,” she told him. Kellogg’s gumption got her the job. The station provided her with experience in marketing, advertising and, later, programming. It’s also where she met her future husband, John Joslyn. Several years later, Kellogg-Joslyn was hired as Disney’s head of programming and spent the next 20 years working her way up to become Disney’s senior executive vice president of programming and production. Along the way, she produced dozens of popular television shows including Who Wants to be a Millionaire? and Live! with Regis and Kathie Lee. While Kellogg-Joslyn was changing the game at Disney, Joslyn was building his own television production company. Shortly after the Titanic shipwreck was discovered in 1985, he led the first television expedition to the wreckage. Then, in 2004, he decided to create something brand new: a Titanic replica in Branson. Although Hollywood and Branson have many differences, Kellogg-Joslyn realized that the attention to detail required to run a museum was similar to that required for television. The couple opened the first Titanic Museum Attraction in 2006. Four years later, they opened a second Titanic ship in Pigeon Forge, Tennessee. Monmouth High School; attended Northwestern University. Although Kellogg-Joslyn considers herself “hobby-less,” she enjoys reading biographies and watching films. The Devil in the White City by Eric Larson. Having grown up near Chicago, Kellogg-Joslyn finds Larson’s thriller extremely interesting—so interesting, in fact, that she’s read it an estimated five times. 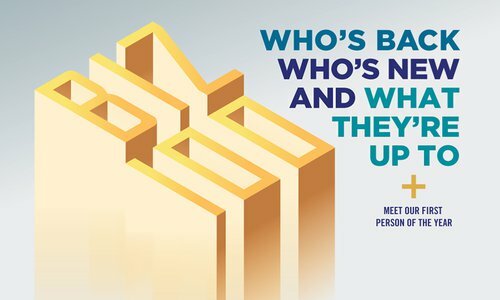 Kellogg-Joslyn’s biggest piece of advice to business owners is to cultivate an engaged employee base. For her, that begins with awareness. “When we first opened the ship, we didn’t disclose our attendance numbers,” says Kellogg-Joslyn, who based that initial closed-door strategy on what information Walt Disney Parks and Resorts chose to release to its employees. However, she soon found that sharing attendance numbers with her staff made them feel empowered, which took Titanic’s hospitality to the next level. “I love seeing [the staff] set high standards for the attraction and for themselves,” she says. “They’ll visit other attractions, and they’ll notice things that we do better on Titanic. That gives them a sense of pride.” Kellogg-Joslyn also ensures that every crew member is educated through Titanic College, a three-month training program she designed. 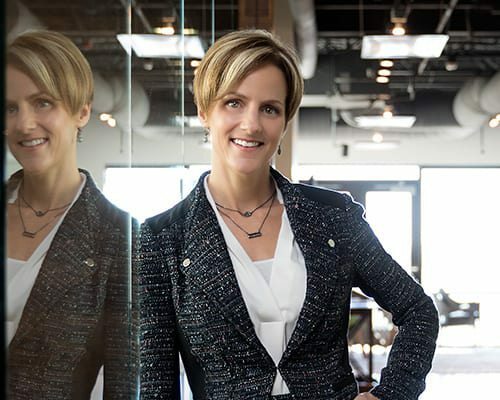 At the end of the day, all of Kellogg-Joslyn’s employee empowerment initiatives come down to her belief that successful organizations are composed of employees who buy into the business’s mission. “We’re more than a history museum,” she says. “We’re an active experience working to touch lives all the time. 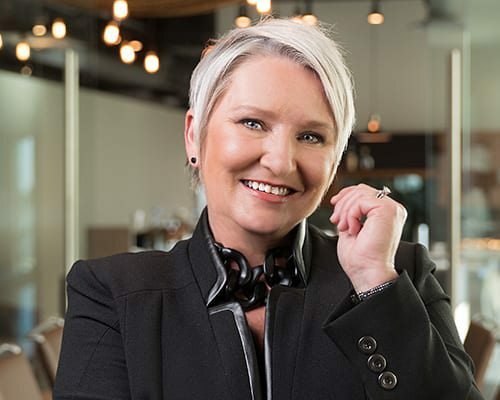 All you have to do is look beyond the obvious.” Kellogg-Joslyn’s vision has certainly gone beyond the obvious, establishing her as a creative mastermind and making a lasting impact on 417-land’s hospitality and tourism culture. Moves to Los Angeles and starts working in the department store’s advertising department. Hired into the sales department at a CBS television station in LA. Lands the marketing and advertising director position at the station after executing an aggressive advertising campaign for herself. Transitions into a programming role. Hired as the director of development and programming and eventually becomes senior executive vice president of programming and production. Opens the Branson attraction with her husband, John Joslyn, in 2006. Opens the Pigeon Forge location in 2010. Sitting at the helm of a massive health care organization, Karen Thomas is as committed to excellence as she is to equality. A certified management accountant, Thomas spent years cutting her teeth in male-dominated fields before taking the reins as head of Oxford HealthCare and, eventually, Advanced Telehealth Solutions. Karen Thomas has never let being a woman in a male-dominated field hold her back. “I was the first female in several of my jobs,” Thomas says. “At the beginning of my career, some people would question my commitment as to whether I wanted to pursue a career—not just have a job.” She shut those assumptions down with her razor-sharp focus, commitment to excellence and willingness to serve in the trenches alongside her male co-workers. She’s a strong believer in equality, raised by a father who encouraged her to avoid differentiating herself from male colleagues—except, of course, when it came to being the hardest worker in the room. 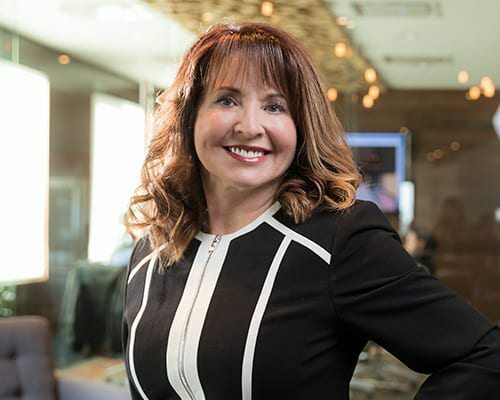 After graduating with her bachelor’s degree in accounting, Thomas became the first woman hired for a supervisory accounting position at Owens-Illinois, a Fortune 500 manufacturing corporation. She then transitioned into a role at Fasco Industries, an Ozark-based manufacturer, where she was the first woman hired as a manufacturing controller. 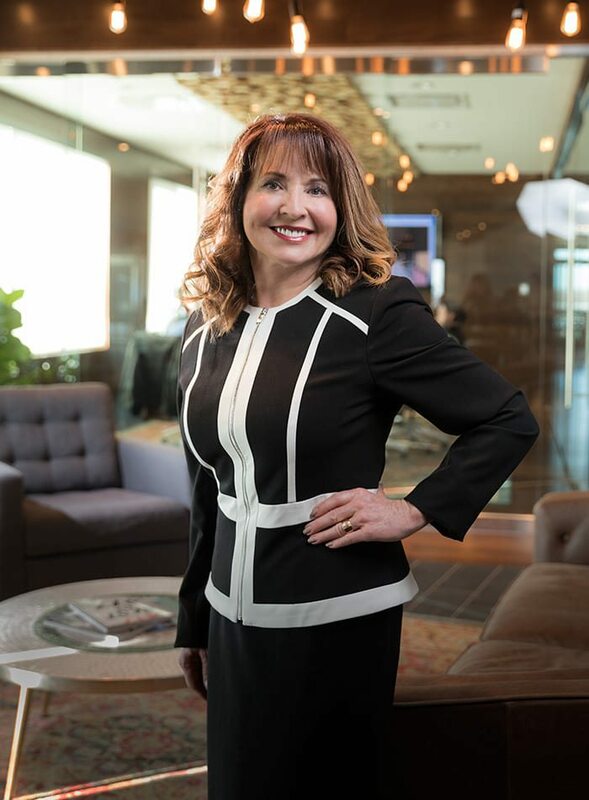 During her 16-year tenure at Fasco, Thomas worked on a wide variety of projects including accounting, shipping, warehousing, information technology, mergers and acquisitions and even opening a manufacturing plant in Mexico. “I’ve never been fond of too much routine,” she says with a laugh, while the twinkle in her eye indicates that she’s never backed down from a challenge. As the leader of Oxford, an enormous health care operation with 1,200 employees and four offices in Missouri, Thomas is constantly looking for ways to keep her staff functioning as efficiently as possible. That’s where Advanced Telehealth Solutions, a remote patient monitoring service, comes in. CoxHealth, which also owns Oxford, initially implemented Advanced Telehealth Solutions to address a nursing shortage, giving relief to an overworked nursing staff. The system worked, and Thomas decided to make it available to health care providers nationwide. Born in San Antonio, Texas, but spent much of her childhood in Monett. Spending time with friends, fitness, golf and photography. Talk Like Ted by Carmine Gallo. Thomas is out of bed by 4:30 a.m. most days. “I like to take the quiet time to know what I’m going to do with my day,” she says. Thomas’s career required decades of hard work. Now, she hopes that she can pass on that dedication and determination to the young professionals she mentors. “If I’m being honest, I really mentor men and women the same way,” she says. “I coach both genders to work as hard as they possibly can and to ignore perceived differences.” Thomas advises young women specifically to inject themselves directly into the workforce without a second thought as to their gender—especially when it comes to working in male-dominated fields. “I didn’t approach any of my jobs by indicating I was any different than my male co-workers,” Thomas says. “I didn’t try to act differently than my other team members. 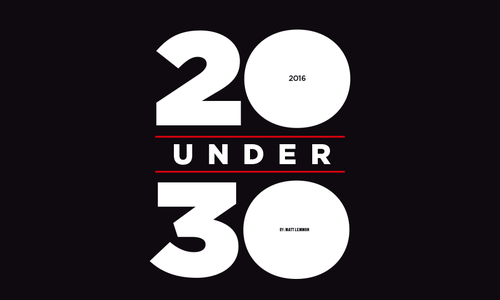 You just do a good job and do your best to fit in.” Thomas’s nose-to-the-grindstone attitude and pragmatic approach to leadership make her a truly inspiring figure for young professionals—male or female. Becomes the first woman hired for a supervisory accounting position at the Fortune 500 manufacturing corporation. Becomes the first woman hired as a manufacturing controller for the Ozark-based manufacturer. Joins the health company to oversee its accounting and business services as well as information technology—a responsibility that resulted in the implementation of a new computer system. Responsibilities grow to include health care delivery operations, marketing and regulation compliance. Appointed president after about five years. Launches this national health care monitoring technology organization, Oxford’s sister company also owned by CoxHealth.